The United Nations health agency says the number of cases in Indonesia's polio outbreak has now reached 155. The UN said the 33 new cases reported in the past two weeks were all in areas already affected by the disease. The polio outbreak is the first in 10 years and many areas are undergoing mass immunisation programmes. Officials believe the outbreak can be traced to Nigeria, where vaccinations were suspended in 2003 after radical clerics said they were a US plot. 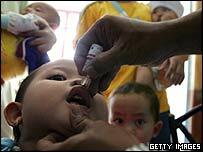 Indonesia first detected polio in West Java province, 120km (75 miles) east of the capital, Jakarta, in April. Indonesian officials say the virus could have been picked up by a pilgrim on the hajj to Mecca, or a migrant worker. Some 6.5 million children have been vaccinated since the first case of polio in almost a decade in Indonesia was detected. Indonesia will launch a new round of vaccinations on 30 August, targeting 24 million children nationwide. The health ministry has said the campaign will cost 230bn rupiah ($21.7m). Polio is still endemic in six countries - Afghanistan, Egypt, India, Nigeria, Niger and Pakistan. The UN has been campaigning to eradicate the disease completely by the end of this year.